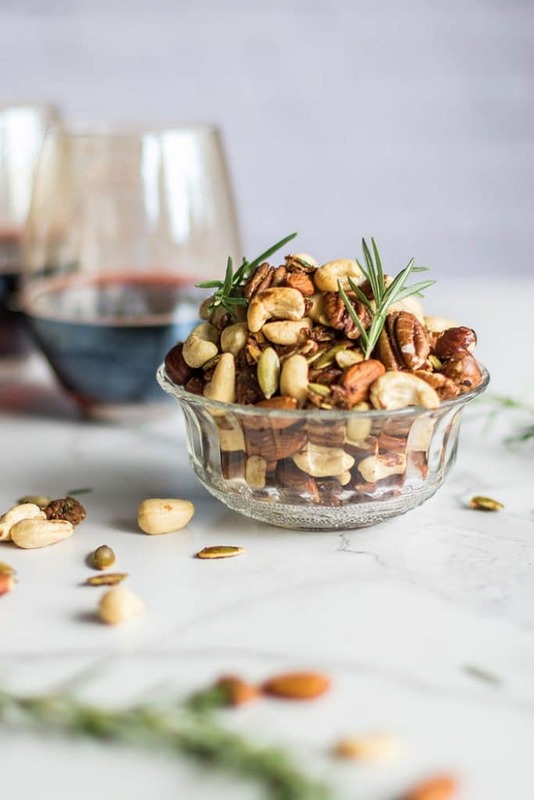 Holiday Spiced Mixed Nuts are an absolutely addictive combination of fried shallots, rosemary, and nuts, spiced with cayenne and sea salt. A little coconut sugar adds a touch of sweetness and a flavor explosion. This recipe is not mine – but I’ve made it so many years in a row, I’m beginning to be known for it. A friend of mine I used to work with, the amazing chef Paul Gandy (an amazing chef, but not a blogger or photographer! ), brought these in to work one year. They were so addictive, the big container he brought was gone before we knew it. I had to make them as Christmas gifts that year — I wrapped up jars of them for everyone’s stockings. On Christmas morning, everyone was cracking open the jars – and then I found myself writing out the recipe several times. It’s that good. One of those recipes you’ll come back to again and again. 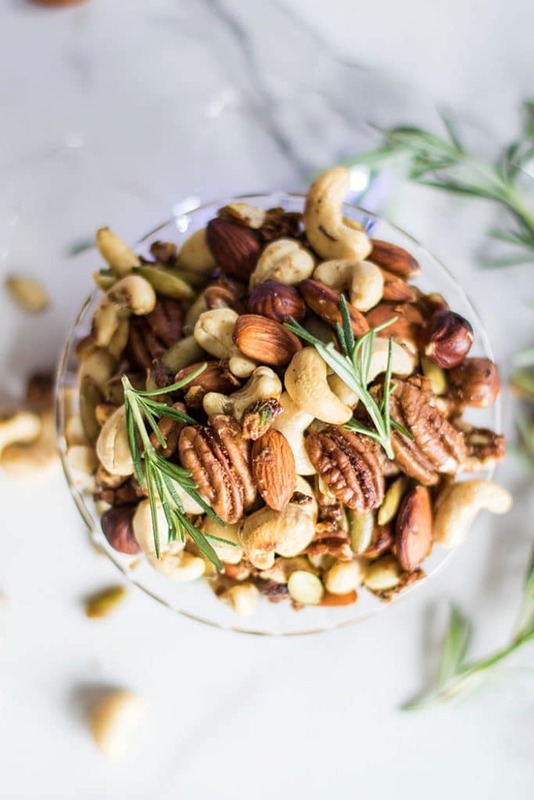 Just a few ingredients turns a regular bowl of mixed nuts into a truly special holiday food. 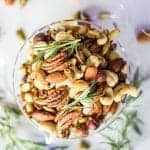 Shallots and rosemary are the big flavors in these roasted nuts, but the sweet/salty/spicy combo is what really takes them over the top. Earlier this week, I shared a recipe for Crispy Baked Coconut Shrimp — these nuts were in the photos, and I offered some suggestions for putting together a healthy holiday party spread in less than an hour. Coconut Shrimp + these Holiday Spiced Mix Nuts = the most popular party host on the block this year. Or take my cue – and make a big batch of these to add to jars and give them as gifts. If choosing this option, I recommend making them within a few days of gifting them. They have never lasted more than a couple of days in my house, but because of the fresh ingredients, I imagine they won’t last longer than maybe a week. Make it Vegetarian/Vegan: Sub vegan butter or olive oil in place of the real butter used in this recipe. Make it Paleo: Sub honey in place of the coconut sugar. You probably won't want to make these unless you're having a party - they are absolutely addictive and it's hard to stay away! 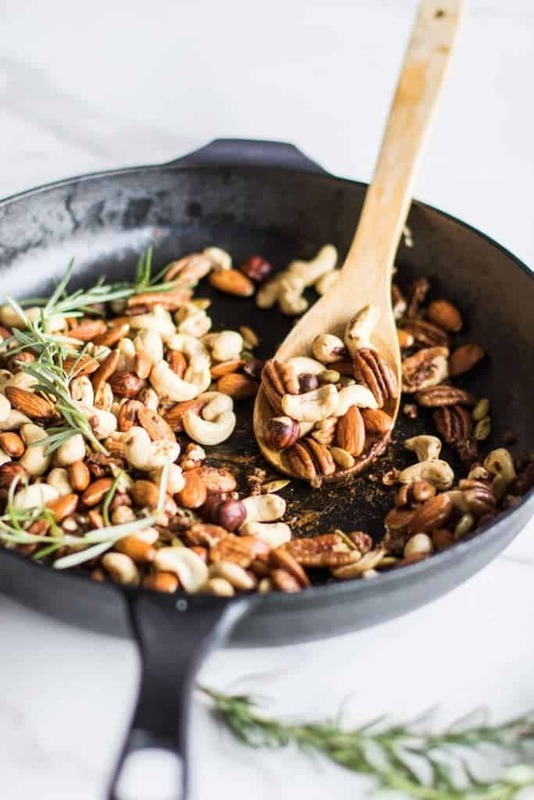 These mix nuts are toasted in a skilled with fried shallot, rosemary, and spices for a healthy (natural) flavor explosion! Add the butter to a frying pan over medium heat. Add to shallots and chopped fresh rosemary, and fry for 5-7 minutes until the shallots are browned. Add the nuts and coconut sugar, and start by adding 1/4 teaspoon sea salt and a pinch of cayenne. 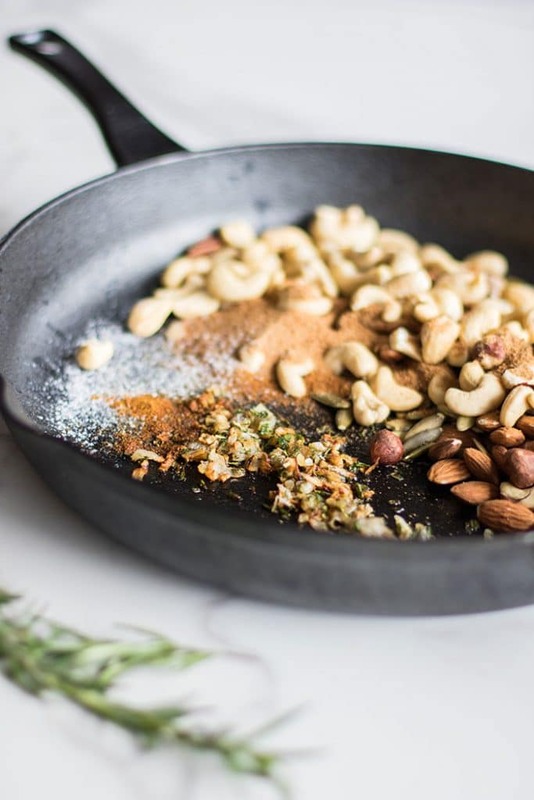 Stir, and allow the coconut sugar to melt and bring the spices and herbs together and coat the nuts. I've found the brown sugar melts better and provides a better coating for the nuts, but I prefer using coconut sugar, which still melts but mostly clings to the shallots and rosemary (it's okay - you'll get bites of this with the nuts!). Add more cayenne and sea salt to taste. Allow to cool, and stir occasionally to keep the sugar from clumping. A fabulous recipe and I love this as a gift idea. I have so many friends that love nuts that I will give these as birthday gifts as well. 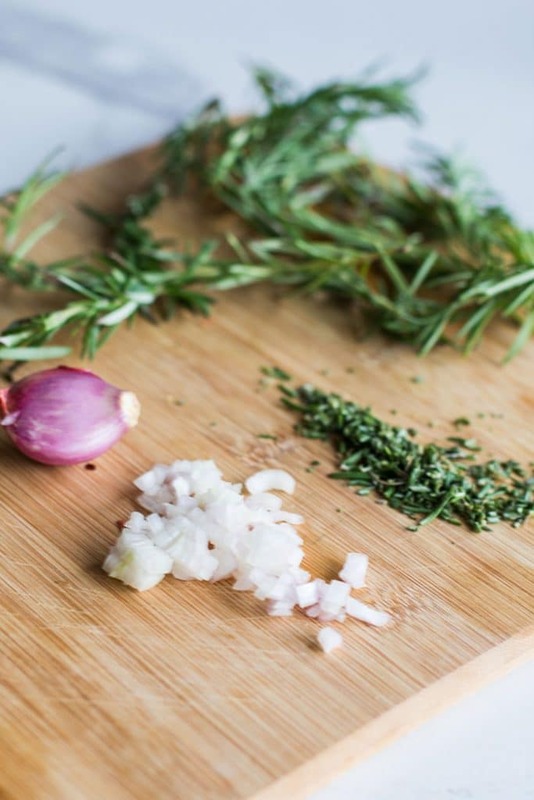 Shallots and rosemary! Fabulous :) Sharing! Thanks Robyn -- we love this recipe SO much! Hope your friends do, too. These are just gorgeous, and you totally had me at the rosemary, I adore it, and have a huge old bush growing just outside my front door! Thanks Sue! I love rosemary, too -- and there just aren't enough ways to use it! I miss having an herb garden! I have tried on my patio in KL and nothing ever stays alive for long! :) I travel too often and they are left alone in the heat. These sounds so good! I love spiced nuts for the holidays. So addictive! Beautiful photos too! Thanks Jenn! They are highly addictive -- I recommend them! OMG! These will not last long in our house!!! They certainly don't last long over here! So delicious. Thanks Traci! The shallots are an unexpected but super flavorful addition!